It doesnâ€™t get any better. 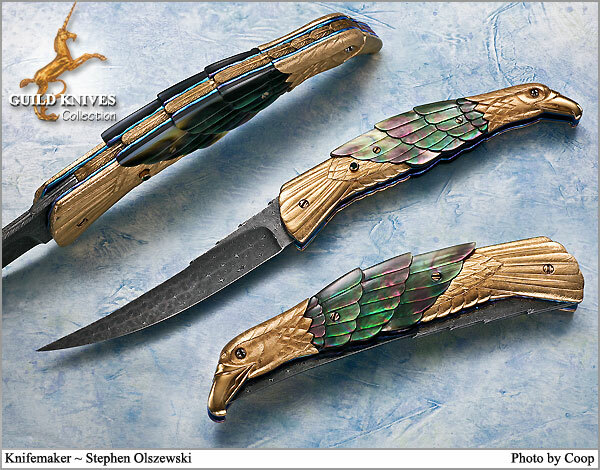 If youâ€™re seeking the epitome of an Art Knife, this is it. Search the web and youâ€™ll not find anything to top it. Few have this much 18K Gold incorporated in their design. Investment Grade Art personified. Note this is an AUTO, which traditionally adds $1000 to a knife of this quality. A similar non-auto gold folder recently sold for $7,500. The Rados Turkish Twist Damascus blade releases with velvet action once the green Emerald is depressed. The realistic feathers are magnificently executed carvings to form the Eagle of 18K Gold and premium Black Lip Mother of Pearl. The backspine has a cascade of 18K Gold feathers encased in blue sky anodized liners. An heirloom of tomorrow.